A key ally of DR Congo's President Joseph Kabila is trapped in an armed stand-off ahead of Sunday's election, according to UN sources. Nzanga Mobutu, son of late Congolese ruler Mobutu Sese Seko, was campaigning on behalf of President Kabila in Gbadolite, in the north of the country. Armed supporters of rival candidate Jean-Pierre Bemba surrounded him inside a radio station, the sources said. Earlier, five people were reportedly killed in a prison riot in Kinshasa. Mr Mobutu had armed guards with him when he went uninvited to the radio station guarded by soldiers loyal to Mr Bemba, a senior UN official in northern Uganda, who has asked not to be named, has said. Some reports say several people have been killed but the UN has not officially confirmed this. It is not clear who fired the first shots. UN sources say the situation in Gbadolite has since calmed and the UN is trying to negotiate the departure of Mr Mobutu from the radio station, our correspondent says. Gbadolite is the Mobutu family's home town but Mr Bemba has strong support there. Tensions are high across the country ahead of Sunday's run-off presidential vote. The two candidates were belligerents in the civil war and both still have loyal armed forces. The stand-off in Gbadolite comes just hours after rioting broke out at the main prison in the capital Kinshasa. A source inside the prison and a human rights groups have told the BBC's Arnaud Zajtman that five inmates were killed in the violence. The police say no-one was killed and 10 people were injured, nine of them lightly. Armed police restored order after several hours of rioting. The unrest started after relatives were stopped from bringing food to prisoners after a breakout earlier in the week. The escapees were convicted of killing former President Laurent Kabila. 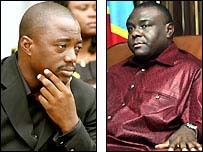 Joseph Kabila, his son, faces former rebel leader Mr Bemba in Sunday's presidential run-off. The 14 soldiers who escaped on Monday had been sentenced to death for their role in the 2001 assassination. They were among scores of people convicted for Laurent Kabila's death. Sunday's run-off vote will conclude the country's first fully democratic polls since independence in 1960.